Leah Moore's miniseries Swords of Sorrow: Dejah Thoris & Irene Adler begins to hit its stride with issue two. The introductions are out of the way and each lady has switched places putting them in totally different worlds. It's a tale of two strangers in strange lands, but it doesn't matter because these ladies are still in charge. Dejah hits the streets of Victorian London in her Mars regalia leaving little to the imagination but quickly adapts to the wintry ways of the period. It doesn't matter that she's on another planet she still commands respect and isn't afraid to brandish her sword either. Meanwhile, the equally confident and capable Adler lands on Barsoom and is suspected of making the Princess disappear. She doesn't have time to waste with accusations. She quickly strikes an agreement with the locals especially when a slimy big game hunter falls through the time portal and looking to colonize Barsoom. 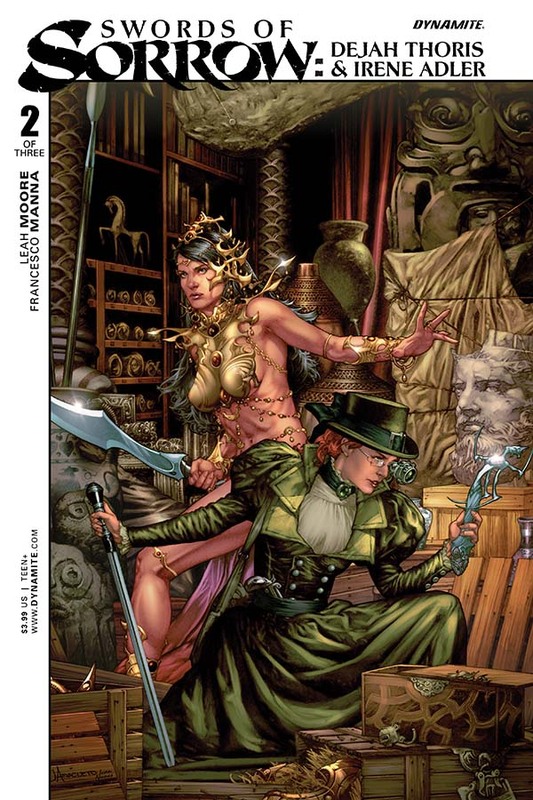 The biggest impression I come away with this issue is that it exemplifies the vision that was set out by Gail Simone who put this event together, hand-picking the writers and female characters involved. Thoris and Adler are the epitomes of female empowerment, bravery, intelligence and leadership. They can hold their own against anyone and without reservation. Unfortunately, this type of characterization isn't seen enough in comics. It's a credit to Moore who gives these characters their voices, instilling a sense of determination and decisive action that makes them so riveting and compelling. Don't misconstrue audacious feminism for heavy-handed or preachy the series is fun, smart and wonderfully illustrated. Manna does a great job of laying out scenes and putting Dejah and Adler in the best light. The thought an artist is tasked to cover up Dejah is quite amusing and ironic in this day and age of comics where sexualized female designs are common. Moore and Manna have put together a smart and exciting but all too short miniseries. It's one of the best-written tie-ins to the main Swords of Sorrow storyline. This penultimate issue sets up what's sure to be an incredible conclusion.